a letter advising my wife, HANNA, that her application for NATURALISATION has been APPROVED and a letter to arrive, in max 2 weeks, will let her know the date and place for the ceremony. 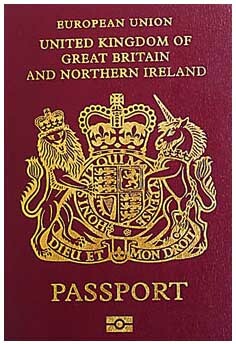 Now with our passports back..... will see where we can go to celebrate.....first stop this weekend...... a family get together..... with my children and of course my grandchildren. Wow, that is great news Yannis. My congratulations to the both of you. My wife has been eligible for a blue passport for 3 years now but it was never important enough to her to go through the process. She is heading home in May for a couple of months and does plan to start things after she returns. I will also congratulate the UK on gaining a wonderful new citizen. Nothing will stop you now...visiting and travelling, wherever you want. It was a long road..... and so many changes by our new Goverment! Today was Hanna's big day and she is finally a BRITISH CITIZEN. Now over the weekend......application for the passport and I hope she will get it very soon. Long way and very expensive road.... but at the end now we will be able to travel without any restrictions and hassle from ignorant airline staff. A big thank you to EVERYBODY for your wishes.....and I am waiting to hear the good news from Malcolm, another board member. Off to go to a restaurant and then a Rushki champagne at home with friends. I just came back from the post office where I posted the application for her first British passport. They say it may take 6 weeks.... but we have to wait and see. Cameron and Teresa have increased fees beyond the joke. Hi everyone and thank you to all, for your congratulations! I would like to say a Big thanks to my beloved husband, who was supporting me all the way, since got together! No new news here. All quiet on the western front! Finally, today Hanna has received her British passport, for which had applied last March, after her naturalisation ceremony! Obviously we both are delighted as now, we can travel nearly everywhere on the world..... without the need of a visa.